Today in Masonic History James St Clair-Erskine, 2nd Earl of Rosslyn passes away in 1837. James St Clair-Erskine, 2nd Earl of Rosslyn was a Scottish peer. Erskine was born James Erskine on February 6th, 1762. 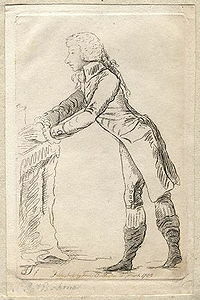 At the age of three he succeeded as sixth baronet after his father passed away. He was educated at Edinburgh High School, also known as Royal High School, before going on to Eton College. After college he went on be commissioned in the 21st Dragoons in 1778. In 1782, Erskine was the assistant Adjutant-General of Ireland. He also began serving in the House of Commons for the English pocket boroughs of Castle Rising. Pocket boroughs, sometimes called rotten boroughs, were constituency in Great Britain prior to the reforms of 1832 and allowed patrons to gain unrepresentative influence in the House of Commons. He served in the House of Commons until 1896, the first two years for Castle Rising the reaming for Morpeth. In 1789, Erskine inherited Rosslyn and Dysart estates after the passing of his cousin James Patterson St. Clair. It was at this time that he added the St. Claire to his name, presumably for political purposes. Dysart Burghs was a constituency in the House of Commons that traditional had been under the influence of the St. Claire's. He would not succeed his uncle as the Earl of Rosslyn until 1805. In 1793, Erskine became Adjutant General. In that capacity he served at the siege of Toulon and the siege of Corsica. In 1795 he was promoted to colonel and named aide-De-camp to King George III. He was promoted to Major-General in 1798, lieutenant-general in 1805 and general in 1814. Politically Erskine was a whig and supported Charles James Fox against William Pitt the Younger in debates regarding the East India Company. He was also one of the managers of the failed impeachment of Warren Hastings, who was then Governor-General of India. After the Napoleonic wars, Erskine was in the House of Lords. There he served as Lord Privy Seal, more formally Lord Keeper of the Privy Seal, from 1829 to 1830 and again from 1834 to 1935 under two different Prime Ministers. In 1829 he was placed on the Privy Council. Erskine passed away on January 18th, 1837. Erskine served as the Grand Master of the Grand Lodge of Scotland from 1810 to 1812.